Translucent Vellum — Premium paper designed for high quality color inkjet printing. This paper is 30 lb (111 gsm). 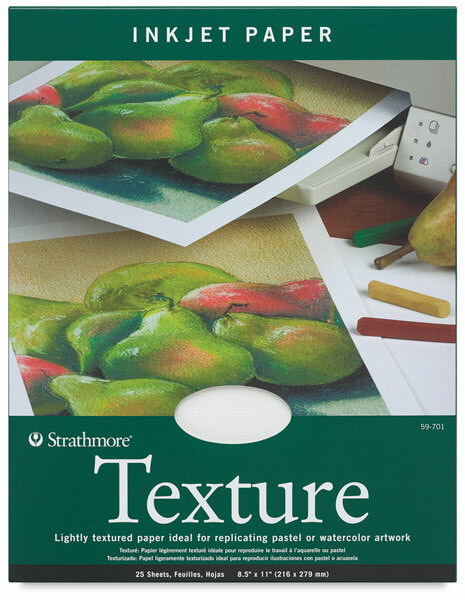 Texture — Print pastel or watercolor artwork with a light textured appearance. This fluorescent white paper is 80 lb (216 gsm). Watercolor — Replicate watercolor works with this medium texture cold press finish paper. It’s acid free and lignin free, and is compatible with dye and pigment based inkjet printers. Along with the traditional watercolor finish, this paper has been coated on one side (matte coating) for inkjet receptivity. This natural white paper is 140 lb (315 gsm).